Pickett and I exchanged a look. We had to admit we had. And then the whole business started. 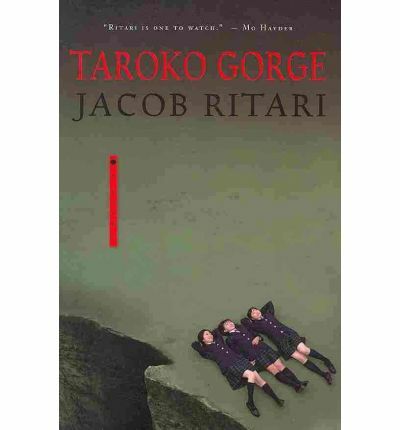 I’ve been keen to try Taroko Gorge by Jacob Ritari since I first heard about it on In Spring It Is The Dawn, where you can also read some of Ritari’s short fiction, and it was one of the books I was looking to buy on my trip to New York earlier this year – I serendipitously found a copy at The Strand Book Store, the only bookshop I manage to visit. In Taroko Gorge, Ritari dissects the world of high school Japan, taking it out of its native zone and dislocating it into a foreign space in the shape of a school trip to Taroko Gorge in Taiwan. In doing so, he simultaneously creates a vacuum in which a single shocking event will splinter and expose his characters and also introduce the multicultural, and often alien, dimension of traveling abroad. We are all familiar with images of Japanese high school kids through the myriad of films, manga and anime coming out of Japan. In some ways this is a very generic and stereotyped vision perpetrated by the Japanese themselves, just as much as we ‘know’ what it’s like to go to an American high school and all the heartache of prom, etc., even though we may never have set foot in one. Ritari utilises this sparingly and together with the Taiwanese police and burnt-out American journalists who are all stranded in Taroko Gorge during a devastating typhoon, he manages to avoid the cliché. In Taroko Gorge, Taiwan’s famous national park, Peter Niels, a burnt-out journalist and his photographer Pickett, a young Californian, come across three Japanese high school girls, Kari, Mai and Taeko, who soon go missing. As they take shelter in the park’s visitor centre, a typhoon approaches forcing the park rangers to call off their search. As night falls and the storm unleashes, Niels and Pickett and the Japanese teacher Tanaka and his students, Michiko, Class Rep, Koizumi and Sumiregawa, must try and understand what has happened and in doing so, peel back the layers behind their past, their friendships and their vulnerabilities. Ritari skillfully depicts the collision of the three cultures using the disappearance of the three high school girls to bring the doubts and paranoia of the characters into sharp focus. The calm, everyday aspect of the characters’ lives quickly disintegrates under pressure and spirals out of control. As some of the characters find strength under pressure, others are surprised by love and friendship which can also be snipped away. Ritari’s depiction of the Japanese school kids is interesting and, I felt, more skillfully done than the American characters and I would have liked to know more about the Taiwanese policemen, so wary and wise. Although I connected most with the high school kids, there was one thing which bugged me and that was the use of Japanese. This will probably only apply to people who speak the language but if most of the dialogue is in English, I didn’t really see the need to insert Japanese sentences. If you are going to do that, you need to get it spot on, otherwise it’ll just stand out and possibly spoil what is a perfectly good chapter. Admittedly this is only a small issue in what is a perfectly well-written and executed novel but I can’t help but feel it may have been better to cut it out altogether. A cross between Picnic at Hanging Rock and the non-violent bits of Battle Royale, Taroko Gorge‘s assured prose and pacing is surprising for a debut novel and I very much look forward to reading Ritari’s next novel, Guardian Angel. Do also check out his short stories about life in Japan. And can I just say how beautiful and still the cover of Taroko Gorge is? I read this as part of Bellezza’s Japanese Literature Challenge 7. Now THAT is an intriguing description. Whoopie! For once, I read a book before you did! 🙂 I probably have to re-read it again ‘cos the writing and plot didn’t quite make an impression on me. Hahaha, I think you’ve probably read lots of books I haven’t since I’m pretty slow at getting to the books I already have! I am not sure this is a book for me but I am glad to get this introduction to it. A very nice review you have written.